Print beautiful photographs and documents with the Canon PIXMA Ip110 Wireless Inkjet Printer. The PIXMA iP110 gives you long-lasting prints with 9600x2400 dpi sharp resolution. It prints as fast as 9 ipm in black and 5.8 ipm in color and supports paper sizes up to 8.5 x 23”. The PIXMA iP110 is extremely portable, features USB 2.0 and WiFi connectivity, and can print directly from Facebook, Twitter, Dropbox, One Drive, Google Drive, and more. It’s also compatible with Apple AirPrint and Google Cloud Print and accepts an optional battery. With a 50-sheet automatic document feeder, the Pixma iP110 prints borderless 4x” in 53 seconds and supports borderless prints up to 8.5” wide. Print photos and video shots directly from your compatible camera with wireless PictBridge and Full HD Movie Print and add creativity to your photos and projects with My Image Garden software. The Canon PIXMA iP110 is simple to use and is the perfect solution for wireless mobile printing anywhere. FiberTique Cleaning Cloth-This cleaning cloth is designed with fine fabric and Fibertique technology to clean all your electronic devices. 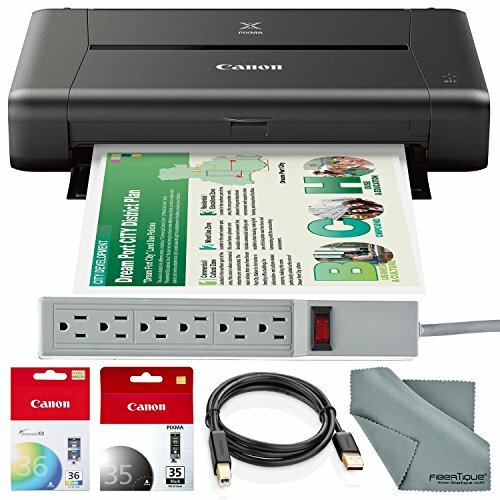 The portable Canon PIXMA Ip110 Wireless Inkjet Printer prints photographs and documents with 9600x2400 dpi sharp resolution. High-quality printer Prints as fast as 9 ipm in black and 5.8 ipm in color and supports paper sizes up to 8.5 x 23". Features USB 2.0 and WiFi connectivity and prints directly from Facebook, Twitter, Dropbox, One Drive, Google Drive, and more. With a 50-sheet automatic document feeder, the Pixma iP110 prints borderless 4x6" in 53 seconds and supports borderless prints up to 8.5" wide. Fibertique cloth included in the bundle is designed with fine cloth ideal for use on electronic devices.